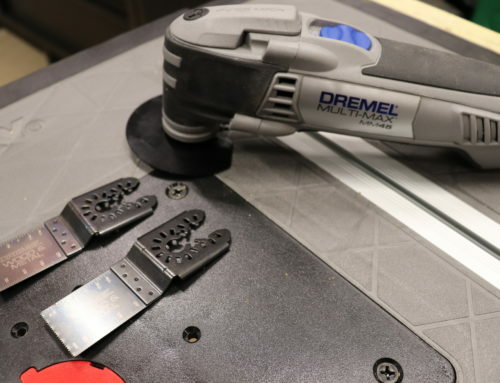 Since we are remodeling and fire / water damage restoration contractors we were somewhat perplexed when we received the Dremel 3 piece kit from Home Depot. Nevertheless we can test and use any tool on the planet so we dove right in. 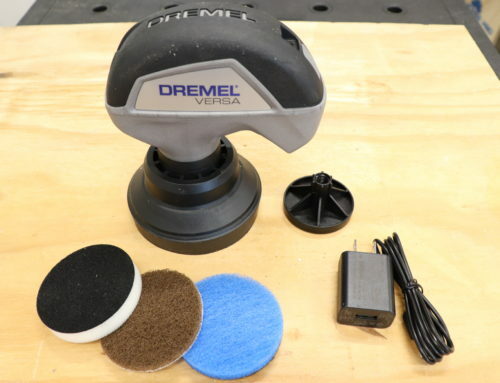 It seems everyone or their Dad has at least one Dremel rotary tool since it is what they are known for. They have been a popular gift item for many years and we can use them for a multitude of applications. This kit also has the MM35 multimax oscillating multi tool and the 6 amp Saw max mini circular Saw. I use them mostly for working on my RC monster trucks and for widening the holes on door strikes when homes sag and the bolt no longer fits correctly. If possible I’d rather re-hang a door properly but not everyone can afford the cost. I have also seen more than my fair share of pre-hung doors with the mortise too high or too low. I think the operators at door factories get a little excited on Fridays and stop checking their work. Maybe they have a little Monday fog, I’m not sure. A quick grinding or cutting session with a rotary tool and all is well with the door operation. The one in this kit is a nice compact unit but still has enough power for anything I would use it for. It has 10 marked speeds and comes with an assortment of bits and Blades to get you started with a variety of tasks. The noise and vibration are about average. I can feel a little tickle in my hand while running it. One nice feature is the built in removable collar wrench. It stores right on the tip of the tool. This makes it easier to keep track of for sure. There is also a regular wrench in the kit if you should ever need it. The MM 35 oscillating multitool is aimed for diy and homeowner use. It will cut drywall and thinner materials just fine but will not cut hardwoods or plywood thicker than about 1/4”. We used it on a bathroom remodel and it cut 1/2” drywall well but found it to be much slower than what I am used to with 3/4” sub flooring cut out. It will eventually do the job but if you are in the construction trades, I recommend a professional model such as a Bosch starlock or equivalent. (Dremel is owned by Bosch so there is a tie in here) For crafts and Home projects this should be fine. It does have a variable speed dial but I never used it on any speed other than 10 which is max. It also has a “quick release” lever on the head that looks like a tool free blade clamp. This is not the case we found. Actually a quick release wrench is what it has on the tool. You must remove it, unfold it and use it to tighten or loosen the blade retention screw. I found the screw came loose often during cutting operations. It was good to have the wrench on hand to tighten things up. It also has a triangular sanding pad which will work as a detail sander. I recommend intermittent use as the tool gets hot after more than about 5 minutes of sanding. It also has a pretty small arc of oscillation so it will be slow going. It should be controllable for hobby use and won’t be so aggressive that you damage your work. To me the most useful tool for me in this kit is the Sawmax circular saw. At first glance I thought it would be useless but I was wrong. I like the blade left configuration because it allows right handlers to use it in their right hand and see the blade for straighter cuts and ultimate control. It comes with a carbide grit multiple material blade that doesn’t look to be very useful for anything but it turned out to be a great performer. It also has some abrasive blades for metal. We used it on the same bathroom remodel and it cut drywall and plywood very well. It has between 0-3/4”depth of cut. We were pleased with how controllable it was on underlayment and subfloor. It really was easy to follow a straight line with the little notch in the base plate. It did get pretty warm under this load so I eased back on it. Dust control was very easy to achieve with it. We simply held a vacuum hose close to the blade opening and got really good results. I realize it would be better for hobby use and Home projects than construction sites but I feel it is good to test the limits of tools to see how they will hold up on lighter tasks and I was pleasantly surprised with how the Saw max performed in this harsher than intended environment. I would like to try a diamond blade on some tile and see how it cuts porcelain tile. It may just replace a grinder or handheld tile Saw. If you need these tools in your garage it makes sense to buy the kit in order to save money. I review and recommend products to help you buy the stuff you need. If you make a purchase by clicking one of my links, I do earn a small commission. My pledge to you is this: I will always say what I really feel. I will not taint my reviews to make a quick buck at your expense. I want you to know the truth about the tools I review for the good or the bad. My picks and opinions are independent from any business incentives. U can use the saw to cut wood too ? I’ve used dremels for things but never had my own, this one looks nice. I dig the reviews and look at them to see how things stack up and which tools I should go for. I saw your Instagram post for the DeWalt kit giveaway and would be very thankful to receive those. I am a student at sentinel career center studying building trades (almost all forms of modern construction) and work at clear choice exteriors, doing demo and rough framing. These tools would be very beneficial to have for my job. Thanks again for the reviews!